Do you know why Muslims are so obsessed with finding the word “Christian” or “Christianity” in the Bible? Because these words do not appear in the Quran.They believe the correct name given to the followers of Christ is “Nasara”, as in the Quran. 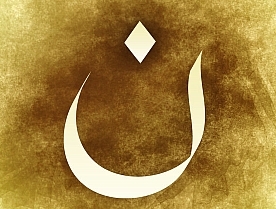 ‘Nasara’ is the Arabic word for Nazarene. What Muslims have failed to realize is that the name ‘nazarene’ was given by Jews to Jewish Christians as an insult. In fact, in Acts 24:6, there is reference to the “sect of the nazarenes”. So the Bible does indeed mention the name nazarene (nasara) associated with Christians! Except that, it was the Jews who gave the Jewish Christians this label as a badge of dishonor because they were followers of Jesus of Nazareth. They were already known as Christians! But what was so insulting about this name, nazarene? The word nazarene comes from the name of the town, Nazareth, where Jesus hailed from. Nazareth was a a primitive, shabby, dirty slum, about 3 to 5 days journey from the glorious city of Jerusalem. The people of Nazareth were looked down upon and despised by the whole nation. They were like the ‘country bumpkins’ of Judea. Why didn’t the author of the Quran know that the word “nasara (nazarene)” was a derogatory slang used by the Jews as an insult to the Jewish Christians? How and when was the author of the Quran influenced by those sarcastic Jews to use this word in his book? Now, let’s look at why the word “Christian” does not appear in the Quran. The English word “Christ” comes from the Greek word Χριστός (Christos) which means Messiah (Masiach in Hebrew). It is THIS word, Masiach, that is found in the Quran translated as “al-Masih”, which means Christ! So, it is false to say that the word Christ/Christian is not found in the Quran. These are English words! Of course you will not find it in the Quran’s arabic text. The Arabic word al-Masihi is the English word Christ! From the word “Christ” come the words Christian and Christianity. Just as from the Arabic word al-Masih come the words Masihi and al-Masihiya. Qur’an tell Christian nasara because it was their first identify after they become out of Islam believing jesus have divinity before then they were Muslim ok even those days Christian didn’t call themselves Christian the name is given by Roman just like ihudi for Jew as they out of Islam they were called before they are bani israel.quran knew what Christian are and Jew are very well .the are able kitab people of book.the first Christian were nazarean what you know about gospel of nazarean why it is not gospel of christian.because you bias don’t know truth.truth is first name Christian have by others it nazarean who considered themselves Jew not Christian they pray facing temple of Jerusalem follow sacrifice sin offerrings.quran tell jesus was Muslim so is his follower after they worship him son of God it is appropriate to call them nazarean than heretic jewis sect. Jewish Nasars are Jesus relatives, so when the Quran says ” لن ترضي عنك اليهود ولا النصارى”, it means neither the Jewish nor even the Jewish Nasara ( Jesus’ relatives, who aren’t Christians) will please you. Mohammad in the Quran is actually Jesus because the Syriac language formulates Jesus as Mohammad in Arabic, so when you read the word Jesus ( which is written in Syriac language) in Arabic, it reads Mohammad.